"...our best choice among the local painters and decorators!" - J.P., Sandy Bay. September 2014. "The work ethic by Bill was exceptional!" - S.P., Mt Nelson. February 2013.
" Thank you for your service and a fabulous job!" - Robyn, Bellerive. November 2011. "I would surely recommend Bill as a great roof painter!" - M.Brown, Hobart. June 2014. "Recommend to anyone needing a job well done!" - Lyn Lovett, Village Manager, Glenorchy Gardens. "Thanks for the prompt, efficient and quality job!" - L&S Thomas, Acton. March 2012. "...the work was first rate. A very happy customer!" - H.G., Claremont. February 2014. "Professional results...All at a pleasing price!" - B.W., Hobart. February 2012. "Brought an old tired building back to life!" - Jenard Training and Personnel, Hobart. "A federation house handled with care!" - J. Sargent, Bellerive. April 2012. Aponia Painters are the expert Hobart Painters! We take great pride in our residential and commercial painting services and only use premium quality as well as environmentally friendly products. We have a carefully selected team of highly skilled, professional tradesmen ready to service all of your painting needs. From new homes to renovations we can provide the level of service required to get the job done. So when looking for a interior or exterior professional painter look no more – Aponia is the team you are looking for. If you are in need for a commercial or residential painter, no job is too big or small. Aponia provides interior and exterior painting services, wallpapering, colour consultations, textured finishes, high pressure cleaning and heritage restorations. It is our imperative to provide the best service we can and to insure that you get your project done hence we offer several payment options including all major credit cards — and because we’re locally owned and operated we are the painters you can trust! We understand the importance of finding reliable tradesmen these days, so with pride we can say that Aponia Painting Services offers 15 years of experience within the painting and decorating industry. Moreover, our focus is on quality of work, attention to detail and most of all service you can trust — all our work receives a 5 year workmanship warranty! We invite you to have a look at our Gallery section to see photos of our previous projects which affirm the quality of our workmanship! Why choose Aponia Painting Services? The Dulux Accredited program is a “by invitation only” program – and we are honoured to be one of the of the selected teams. When choosing Aponia you are choosing an Accredited member – this means that you are about to receive impeccable customer service and choose a business with a proven track record of customer satisfaction. Moreover you will employ a local painter that implements sustainable environmental practises. 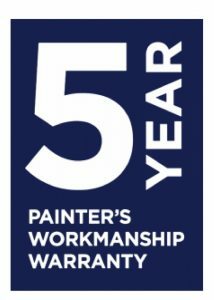 We are proud to offer all of our customers a courtesy 5 year workmanship warranty! With our warranty, your newly painted surfaces are covered for any blistering, bubbling or cracking that emerge due to faulty surface preparation as well as faulty paint application.This way you can rest assure about the quality of your finished project. You can read more about this fantastic feature of our business by clicking here. Aponia is an Ebix approved business. So who is Ebix? Ebix Trades Monitor is an Australian independent insurance compliance monitor company. The purpose of Ebix is to overlook Dulux members’ compliance with required licensing and insurance. In more detail, Accredited Painters are required to hold a current policy for public liability insurance with a cover of at least $5 Million. One more reason to choose Aponia as your reliable painter!